Jennifer is another great gal I wouldn't have ever met if it wasn't for this little blog. She and her honey, Aaron, tied the knot earlier this year. This is their simply elegant wedding. 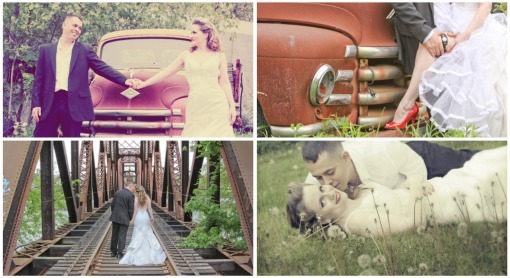 "At first, I was a bit confused about our overall vision for the wedding theme. We knew we wanted a small wedding to curb costs, so we went with simple yet elegant. We had the attire of an elegant wedding, the venue for a simple wedding and DIY most of the decorating." "I originally thought I wanted a ball gown since I was always SO in love with that look since I was a little girl looking in bridal magazines. After trying on LOTS of dresses, mainly all ball gowns, I was coaxed into trying on slimmer styles and low and behold, the dress I chose made me feel like a supermodel on the runway or a celebrity on the red carpet. I had to have it! Although after having to wear it for a long period of time instead of a 5-minute try on, I totally wish I went with something lighter and shorter (in the train length) so that we could have done our choreographed first dance. It really upset me that we weren’t able to do that. We tried the day of when we were off to the side but I stepped on my dress so much, I would have tripped and let’s not go there with twirling! Bad enough my bustle broke during the reception!" "Thanks to lots of wedding blogs, there are SO many awesomely cute ideas for DIY wedding looks. In my opinion they are even more beautiful than when someone else brings in the products. 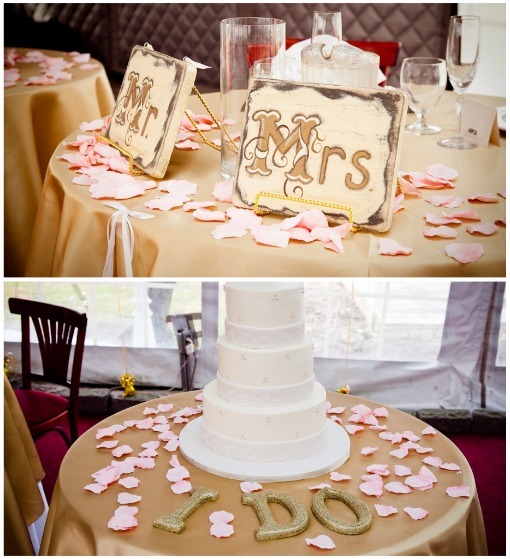 I painted letters that spelled out “I DO” for our cake table. We bought those at Michaels. That place is your best friend when planning a wedding, I tell ya! Okay, this may have been the only REAL DIY thing done, but we did the entire set up of our wedding reception. We placed the silk rose petals where we wanted them, placed our (purchased) tablecloths where we wanted them, etc. Ironing those things was VERY DIY. Thanks to my husband and his help that was done!" "We wanted the reception to feel personal, fun and intimate. We loved that we were able to enjoy our big day with just our family and very few friends. Seriously, there were only three friends there with their spouses. Sure, if we could have afforded more, it would have been nice to invite a few more, but I enjoyed it the way it was." "We didn’t really give much direction for the photographer during our wedding. We figured they are the pros, they should know what to do to get their job done. Our trash the dress session was with a different photographer who I know and she had the same ideas as us-to make it a vintage feel. We just drove up to her studio and she had her way with us around her town." 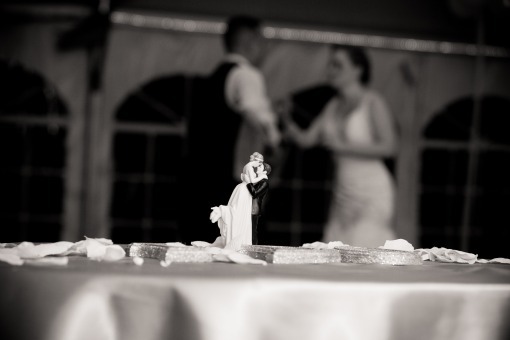 "My favorite part of the wedding was the ceremony, without a doubt. The feelings I had up there saying my vows were so amazing. 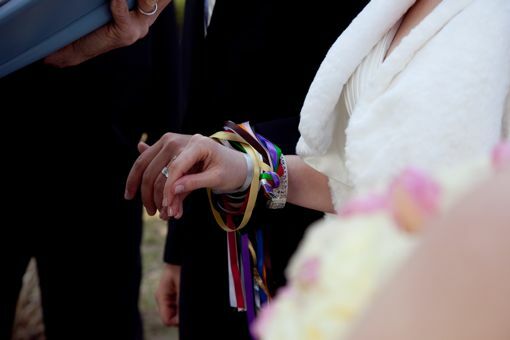 Doing our Celtic hand fasting part of the ceremony was also just as emotional for me. I had never been happier than I was at those moments." 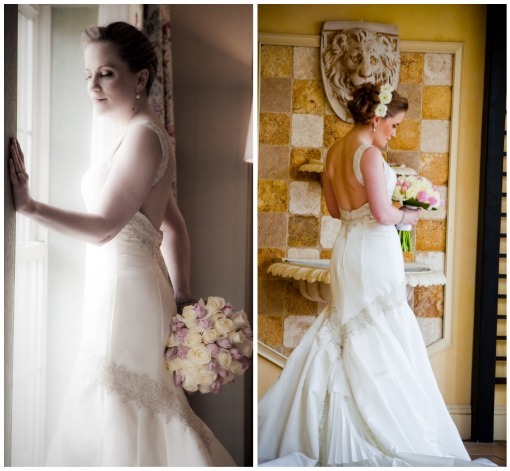 What a simply elegant wedding captured by Christopher's Studios. Oh, and those trash the dress shots by Jewel Photo...WOW! You can actually catch more of those over on WeddingWire. For more stories about this cute couple, visit Jennifer's blog Books, Recipes, and Life, OH MY! here on good ol' Blogger. For a complete vendor list, follow this link. 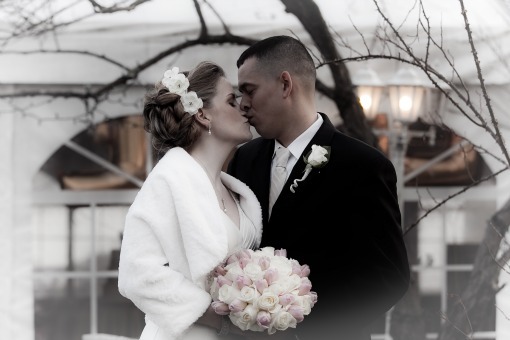 Thanks a million, Jennifer and Aaron, for sharing your special day with us. We wish you many, MANY happy years together. Love it! Thanks for putting us on your blog! Jennifer is stunning! Love all the pictures! gorgeous gorgeous gorgeous!!!! That first picture is beautiful!